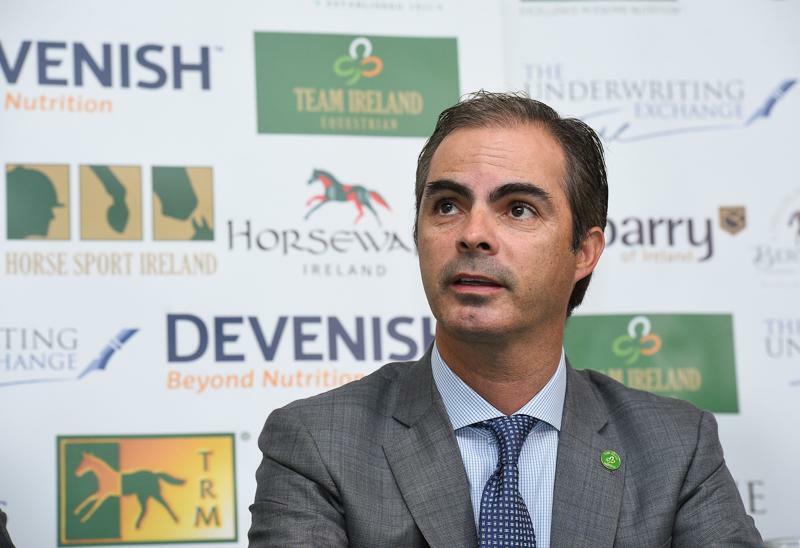 With just six days to go before the start of the Dublin Horse Show at the RDS, Irish Show Jumping team manager Rodrigo Pessoa has named his four team members for next Friday’s Longines FEI Nations Cup of Ireland for the Aga Khan trophy. Pessoa (pictured) will name his reserve rider for the Aga Khan next week and speaking ahead of Ireland’s biggest annual equestrian event, he reflected on what has been a very successful recent run of results. “We have come off a very successful triple header [Falsterbo, Aachen and Hickstead]. We have had a week off and like always we are looking forward to coming to Dublin and hopefully this team can go all the way. There will of course be a lot of expectation for the Aga Khan but this is a very experienced team of riders that will give it everything,” he said. The Stena Line Dublin Horse Show gets underway on Wednesday at the RDS. Friday afternoon’s Nations Cup for the Aga Khan Trophy will be shown live on RTE TV. Other highlights during five days of action include the Young Horse classes sponsored by Horse Sport Ireland, the Land Rover Puissance on Saturday and the Longines International Grand Prix of Ireland on Sunday.